As a Fayetteville homeowner, your responsibilities are not just inside the home, it is about taking care of the outside, as well. The exterior of your home is what makes the first impression and adds to the curb appeal. Your landscaping plays a large role in how the exterior of your house looks, but it should be about your own personal enjoyment, not just making an impression on others. Establishing that perfect green lawn, watching the flowers you carefully selected bloom and watching your favorite type of tree thrive over the years is all part of it. Yet none of this is possible without regular watering in order to keep these things healthy and growing. How is is possible to get a proper watering schedule in place? The best solution is implementing an irrigation system in order to get watering done when you need it, without taking care of it by hand. A common mistake homeowners make is thinking that they can invest the time needed to regularly water their own lawn. Consider the options and benefits that you have for setting up irrigation, for a more realistic schedule to water your lawn. Why would you risk the health and well-being of your lawn and landscaping when all you need to do is set up a system for watering it? Keeping your greenery healthy is a chore, but repairing or replacing it once it is beyond repair is even more demanding – as well as expensive. Take back your free time. Stop wasting evenings and weekends watering your lawn. During the establishment phase of your grass, the need for regular watering is especially demanding. Miss even one session and you could cause irreparable harm to your lawn. Set up a regular watering schedule that you don’t even have to be around to take care of. There are a number of options for types of irrigation systems, as well as the frequency to which they are set. Once your grass is established you will not need to water it as often. However, a simple adjustment will make it handy for use for watering your grass and landscaping will still require. Keep in mind that your watering schedule also changes throughout the year. Different seasonal demands require more or less watering. You can easily set up your irrigation system to accommodate this. It is a common and harmful misconception that grown trees no longer require water. All living things require water. That would be like saying an adult human no longer needs water. While it is less for continued growth, it is required for good health. Also, don’t buy into the erroneous belief that drought-tolerant plants do not need water. They can survive drought conditions, but rarely thrive through them. Keeping them watered is what helps ensure their survival through any dry weather conditions that may pop up. 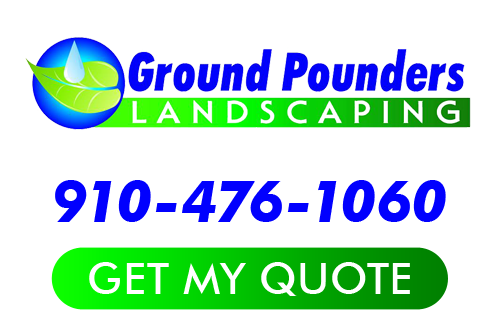 To find out more about the benefits of irrigation, or to get your system set up, call Ground Pounders Landscaping, Inc. today. Since first launching the business in 2007, we were immediately able to secure our reputation as the local leading service providers. The bottom line is that we take this field of work seriously. This includes offering individual care to each customers, instead of taking a one-size-fits-all approach. We know the industry and care about our clients, which is the perfect combination to earn customer satisfaction. Let us help you better comprehend how this will help you, as well as show you how we have earned our impeccable reputation. Get in touch with us today and let’s begin working on your irrigation system. If you are looking for Fayetteville Irrigation Systems then please call 910-476-1060 or complete our online request form.